It was time to open a bottle of our new spoils last night, and this was our choice. I made a coconut curry chicken (courtesy of winophiled! ), and we figured a sweeter riesling would work well with it. 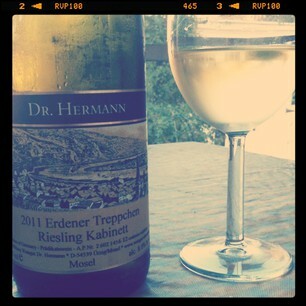 I have written about the Dr. Hermann winery here. I said it before, but I really think German rieslings with their acidity and sweetness are a great companion especially for Asian foods. The Erdener Treppchen tends to produce wines that I am particularly fond of, with a subtle nose and good fruit. June 16, 2012: Nice apple nose. On the palate creamy and rich. Good acidity, pleasant sweetness. July 20, 2012: I can still identify apple, but also peach and some pear. On the palate, initially a nice amount of acidity, but then the sweetness is a bit overpowering with strong ripe notes, notably honey. Lasting finish. Over time, the fruity notes (especially apple) are coming through. As you can see, I rate this wine quite sweeter in the tasting today than in June, probably because we had a number of wines before this one. To me, the wine definitely seemed more like a spätlese than a kabinett which should be a bit lighter. It was quite rich. That said, it is probably an even greater value at around $11 at the winery. The pairing with the food was ok. The sweetness was just too much for this type of food. Frankly, it was sweeter than I expected it to be when I checked my notes. Overall a great wine, just not the best pairing for my food choice.